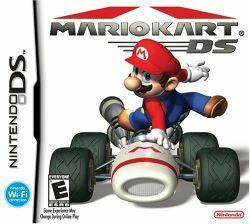 Mario Kart DS is the first online game in the series for the Nintendo DS portable platform. It is also Nintendo's very first attempt at including total online multiplayer gameplay. While online play via Nintendo Wi-Fi Connection is not considered as fleshed-out as it could have been, the game itself was well received by critics. Racing in Mario Kart DS involves various characters from other various Mario games racing each other in go-karts on tracks themed from locations in the series. Less realistic physics, and the use of various weapons and or items to achieve victory differentiates kart racing games like MKDS from racing simulators like Gran Turismo. Mario Kart DS multiplayer supports up to eight players via wireless linkup, and up to four players via Nintendo Wi-Fi Connection. This page was last edited on 26 August 2016, at 21:25. This page has been accessed 56,175 times.